Her writing brings me down to earth as a pastor. 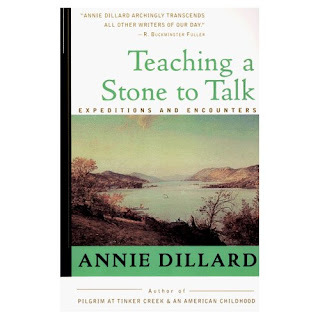 I am referring to Annie Dillard and her funny and unnerving exposition titled "An Expedition to the Pole" in her book Teaching a Stone to Talk. In a captivating interplay between attending both Catholic Mass and Congregational services and the adventures, hardships and tragedies of Arctic and Anarctic explorers, Dillard expresses the wonder and absurdity of human beings trying to reach God, "the Absolute [as] the Pole of Relative Inaccessability." The Pole she terms as "the Pole of great price." "Every Sunday for a year I have run away from home and joined the circus as a dancing bear." This is Annie's description of herself (and others ) who join together to meet God in a church service. "Week after week we witness the same miracle: that God is so mighty he can stifle his own laughter. Week after week, we witness the same miracle: that God, for reasons unfathomable, refrains from blowing our dancing bear act to smithereens. Week after week Christ washes the disciples' dirty feet, handles their very toes, and repeats, It is all right--believe it or not--to be people." Early Polar explorers, standing on their dignity and own beliefs about what they needed to explore the Pole of Relative Inaccessability, left comic-tragic debris of their misunderstandings of just what they were attempting. Unprepared food-wise, clothes-wise and carrying the least likely to help supplies---sterling silver tableware embossed with each officers initials. One officer whose feet froze and made him a liability to his men, announced to his men as he stepped out of his tent to freeze himself in a blizzard, "I am just outside and may be some time." "The churches are children playing on the floor with their chemistry sets, mixing up a batch of TNT to kill a Sunday morning. It is madness to wear ladies' straw hats and velvet hats to church; we should all be wearing crash helmets. Ushers should issue life preservers and signal flares; they should lash us to our pews. For the sleeping god may wake up and take offense, or the waking god may draw us out to where we can never return." "Wherever we go, there seems to be only one business at hand---that of finding workable compromises between the sublimity of our ideas and the absurdity of the fact of us.... If, however, you want to look at the stars, you will find that darkness is necessary. But the stars neither require or demand it." Pastors can get so full of themselves. Leading their crews to the Pole of Relative Inaccessability, they end up dying as they stand in their dignity and supposed understanding of the Wholly Other. God, to quote Annie, "does not give a hoot" about what we think impresses him. We can die on the Polar ice with our silverware and chocolate in hand with our diary reporting how we froze to death in "the icy halls of frozen sublimity." 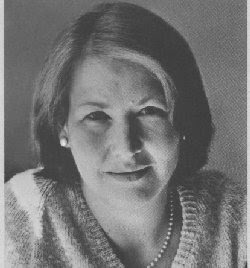 Thank you, Annie Dillard, for a reminding us of our inescapable humanity.